PTCL has launched PC Application of SmartTV, which let you watch 125+ high quality TV channels on your PC or Laptop. This service is free for first two months of its launch. From June 2013, monthly charges will be Rs.250/ month. Below are given complete details and features of Smart TV Application. Charges for Smart TV are Rs.449 per month while you also have to purchase Set Top Box which cost you Rs.4,999. How to Check if Samsung LED TV is Original or Fake? Today PTCL has announced PC application of SmartTV and you can enjoy 125 TV Channels with high quality graphics on any PC or Laptop. As it is an application, so you don't need ant Set Top Box or other hardware. PTCL Broadband is required for this service. Just call at 0800-80800 to activate subscription, plug your DSL cable in modem of PC or Laptop, install application and enjoy live channels stream. This application can be installed on Windows Vista, Windows 7 and above operating systems. 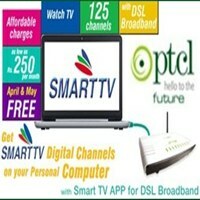 SmartTV App is available on PTCL website. Subscription charges of SmartTV PC Application are Rs.250 per month but these charges have been waived of for the month of April and May 2013. Video on Demand and Playback features are not available in this application, you can only watch live TV Channels. This application is absolutely free with SmartTV and SmartTV Jadoo Plus packages. I certainly believe its a great initiative by ptcl. I, for one, always wanted to see live streaming on my laptop.